*Minor spoilers* The original Jurassic Park was one of the first movies I loved as a kid. My parents had no qualms about me watching it, compared to say, Jaws, because dinosaurs don’t exist anymore and thus it would be less scary. Although I literally just read an article that said scientists may be able to recreate living dinosaurs within 5-10 years. Thankfully we have four Jurassic movies to show why that could be a bad idea. Welcome to Jurassic World. Taking place 22 years after the first movie (did Lost World and III not happen??? ), humanity seems to have dinosaurs under control, well at least they think they do to have another crack at a theme park, with more kid-friendly rides and the whole shebang. A young boy named Gray (Ty Simpkons) and his teenage brother Zach (Nick Robinson) go to Jurassic World, not just because Gray is obsessed with dinosaurs, but also to spend time with their aunt, Claire (Bryce Dallas Howard), who is Jurassic World’s operations manager. Being head of operations, Claire doesn’t have time to show the boys around because she’s trying to attract corporate sponsors to expand the park, so she gets her assistant to show them around. Meanwhile, Claire is showing velociraptor trainer Owen, (Chris Pratt) their new “asset”, a genetically modified dinosaur hybrid, the Indominus Rex, when it manages to escape and starts to wreck havoc on the island, and the boys are in danger. By the way, I really hated Howard’s character. The movie must have tried to build sympathy for her by presenting someone trapped by the corporate world interfering with his family life, but it’s hard to feel that when she (and many of the other characters) have almost no reaction to their co-workers deaths. The only who does is Pratt’s character Owen, – who is highly likeable in many ways – he didn’t just train the velociraptors, he connected with them like family pets. He may be the only one who doesn’t describe the dinosaurs as “assets”. The fact that he remains sympathetic to Claire makes my blood boil. Rather than a protagonist, I see her on almost equal footing as the so-called villain Vic Hoskins (Vincent D’Onofrio), who wants to use the dinosaurs for military purposes; and the sole returning character, Dr Henry Wu (B.D. Wong) who designed the creature to be a killing machine (but he did what he was told I guess). I swear the next Jurassic movie better chuck her in a jail or something. So yeah, those were the main problems I had with Jurassic World, but it’s still a great movie. It’s exactly what moviegoers will want to see. The pacing is strong, a testament to good editing. You get the awesome special effects and you get dinosaurs interacting with humans. You can tell production really enjoyed inserting John Williams’s iconic score from the original film for that establishing shot of the theme park. The spectacular reptilian battles will satisfy those disappointed with last year’s Godzilla reboot for not having enough epic monster fights. By the way, the climax of the movie is what changes it from a good movie, to a great movie! You’ll see for yourself. Jurassic World is laden with references to the first movie, a bit of humour, and unsubtle social commentary. That social commentary, aside from the obvious “this is why science shouldn’t clone dinosaurs”, I picked up fairly easy. A critique of capitalism, as those at the top decided bigger and more dangerous creatures would boost profits, is what led to the big crisis, as well as taking away from Claire’s family life. The militarisation of these dangerous creatures is also placed in the limelight, a possible allegory to other very dangerous weapons. Is the movie a slap down on American capitalism and militarisation? Or am I just thinking about this too much? Well, that’s I got from it. Most people aren’t going to care about any messages that may or not be there, they just want a great popcorn-munching and movie-viewing session. 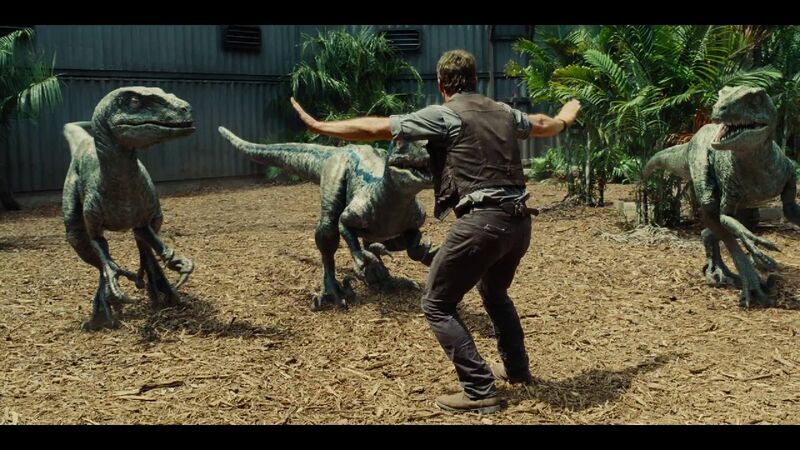 The issues I have with Jurassic World ultimately do not ruin a very enjoyable experience. The box-office is going nuts for this, and it’s easy to see why, it appeals to everyone – the fans, the critics and general public, and it’s just plain fun. 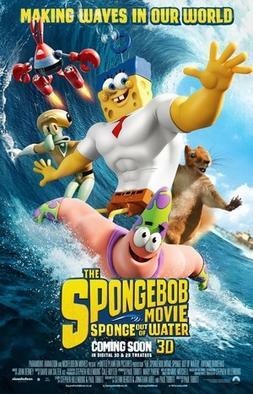 This second SpongeBob film doesn’t do anything new to justify the trip to the big screen, unlike the South Park and Simpsons films…or the first SpongeBob movie for that matter. Once again Plankton tries to steal the Krabby Patty formula, in a slightly more dramatic fashion than usual. Then it disappears from thin air and Bikini Bottom becomes a post-apocalyptic zone. SpongeBob believes Plankton is innocent, so he shields him from the backlash. There’s a live action thing going on at the same time where we see that the Krabby Patty formula was actually stolen by some pirate who finds this book that makes any text that is written in it become reality. Then later on, SpongeBob and friends become superheroes out of water, which judging by the marketing campaign (and the subtitle! ), you’d think was the premise of the entire movie, but nope it’s in the second half. It seems like they were band wagoning on The Avengers or Big Hero 6. The first movie was great not just because it was funny, but because it led SpongeBob and Patrick on an epic journey to find King Neptune’s crown; not only to restore order, but for SpongeBob to show that he’s more than just a kid. That was the emotional hook. And spoiler alert for that film, but SpongeBob and Patrick end up reaching the surface, and, thinking they are about to die, felt satisfied that they at least found the crown. That always stood out for me. In Sponge out of Water, they again go back to the surface, but they don’t do anything interesting with the superhero concept or the characters. This movie is not bad, but it does reek of corporate fulfilment. In short, Sponge out of Water feels like the new Simpsons episodes – it’s short on new ideas, repeating the old ones and exists just because it can, not because it should. But maybe that doesn’t even matter, because I’m sure the kids will enjoy it anyway. I just realised the last movie came out 11 years ago, when I was 11 years old, back when I was still the target audience. That is something to keep in mind, SpongeBob may not be for me anymore – it’s for kids, and they could see a lot worse.